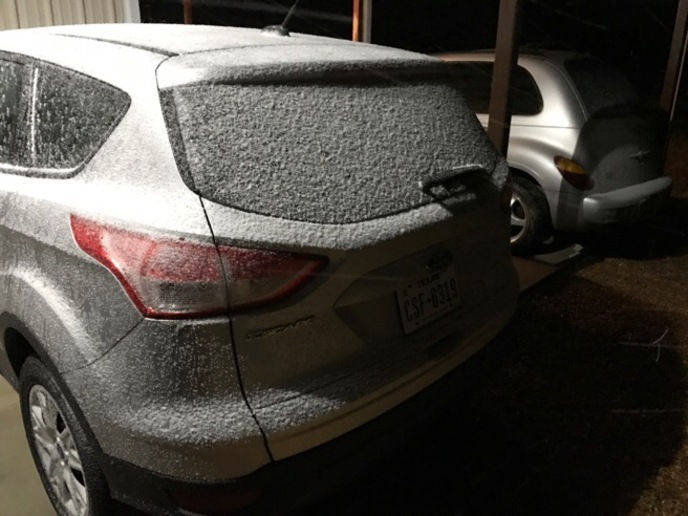 Getting snow here in San Antonio right now, crazy Texas weather. None on Taylor/Jones co line. Just chilly. compounded it by complaining that 76* was too hot. Same here in Centerville. Leon county just cold rain. He needs to come down here in the summer when its over 100 degrees with 70% and up humidity, then he will see what too hot really is! Snowing here in Schulenburg now. Changed from rain to sleet and now snow. Temp is now 32*, Monday it was 84*. and ice on a saturday morning turned Dallas into a Holiday town. we had a few light flurries in Temple but nothing on the ground. my brother says it's snowing in Corpus Christi. I live in San Antonio (Rigsby/Loop 410) area, our farm is out side of Stockdale. Does Bob Adamack still have that roadside cafe (where the Greyhound bus used to stop) that advertised being open "26 Hours"? Made some super pies. Bus used to stop there on the Houston-San Antonio route back in 55-56 time line that I rode it. Nope, Bob closed up shop a few years after highway 90 was relocated from main st to its present route. He is now deceased.